Recently, I visited the Chihuly Garden and Glass museum in Seattle. 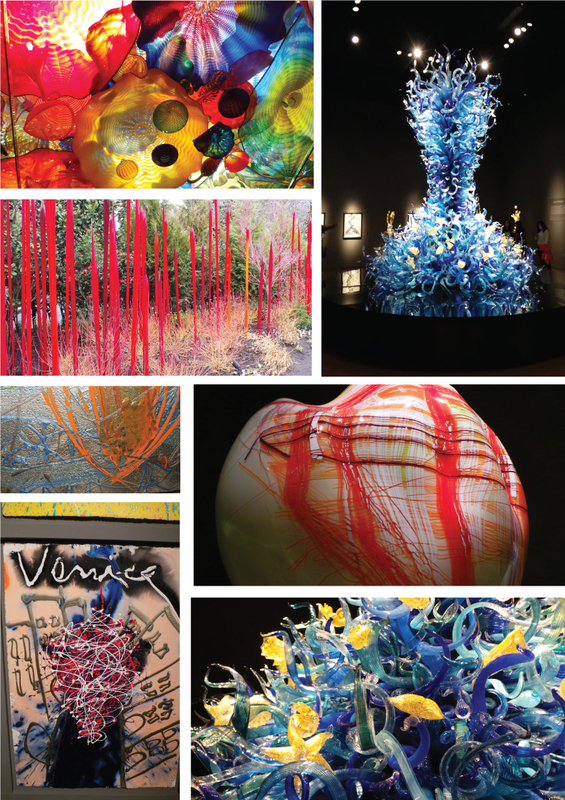 Dale Chihuly is a world renowned glass artist from Seattle and has lead glass blowing into a fine art. The exhibition is full of brilliant color, unhindered forms and is a celebration of ﻿a single material. The garden is especially delightful as each area is punctuated by organic glass shapes that mimics nature in a dramatic way. One aspect of the exhibition that was a pleasant surprise was the painting and drawings of Dale Chihuly. I like them because they are as powerful as his three dimensional glass sculptures but in two dimension. The paintings are large and colorful, many times using metallic paint. They made my friend, Suzanne and me want to go home and paint! If you ever have a chance to see the museum you should. You can't miss it because it's right under the iconic Space Needle.